While there is much written on the subject of how to search the various talent sources available to recruiters and sourcers today, such as the Internet, LinkedIn, Facebook, Twitter, Google+, ATS/CRM systems, etc., there does not seem to be much written about their ROI as sources of talent/human capital information. I believe that the value of any source of information is 50% based upon the actual information contained within (data depth), and 50% in the ability to extract out precisely and completely what the user needs (searchability). Information has no value if you are unable to easily access, effectively search for and find what you need and take action on it. When it comes to leveraging information systems for talent identification and acquisition, it is critical to assess the depth of the talent/human capital data offered by the source as well as how “searchable” the source is. 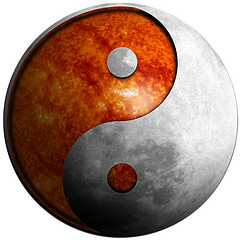 Why is Data Depth and Searchability Important? Quite simply, the deeper the data offered by and the more searchable the the source is, the higher the ROI for your sourcing efforts. All electronic sources of talent are NOT created equal, and some offer sourcers and recruiters instrinsic advantages with regard to the ability to more quickly and precisely find more of the right people, yielding higher productivity. I’ve created a graphic representation of a comparison of the data depth and searchability of the most common information systems used by sourcers and recruiters to find candidates. The whole point of using information systems to search for candidates is to find people who have specific skills and experience, and typically people who live in a specific location. It’s not terribly difficult to find PEOPLE, but it can be very challenging to find the RIGHT people. As you can see from the chart above, I’ve classified Facebook, Google+, Twitter, and the Internet (non-resume results, such as press releases, company directories, etc.) as shallow sources of talent data. This is because these sources either don’t offer much in the way of professional/occupational information (often a title and little else), and/or they have very little information as to the exact location of the potential candidates. In most cases, they contain very little information regarding critical candidate variables such as skills and responsibilities, quantity and quality of experience, career history and accomplishments, education (Facebook being the exception), precise location, etc. Many shallow sources of candidate information simply do not provide ANY information regarding some of these details. This is because the majority of people who use sites like Twitter and Facebook often don’t include professional/employment information on their profile. With little or no information to go on, it is extremely difficult to search for and identify candidates who have a high probability of at least meeting the minimum requirements for your opening, let alone exceeding them. While you can certainly search Facebook to find people – Facebook has significant limitations with regard to its “searchability.” Facebook simply was not designed to be highly searchable, at least not to find people you don’t know, and certainly not based on professional info beyond title and employer. You may think I am crazy for saying that the Internet isn’t very “searchable,” but most search engines, including Google, don’t even support full Boolean logic. Also – the Internet itself is unstructured, which makes it intrinsically difficult to find exactly what you’re looking for without drowning in a sea of false positive results. Sniffing out and following candidate leads based on shallow information and using sources that aren’t by design highly searchable comes with the territory of being a sourcer or recruiter, and the thrill of the hunt can be quite satisfying. However, the angle of this article is ROI, or even more specifically ROTI (Return on Time Invested) – which is a good measure of productivity (Productivity + Work / Time). Trying to search shallow data sources with limited search capability can be an incredibly slow and time consuming process, as well as result in a significantly low return on time invested. I refer to this as “low yield” sourcing, and its cause is the shallow depth of information available and poor searchability of the sources – which cripples your ability to control or even identify critical candidate variables. In this quadrant we have many ATS/CRM solutions, as well as Internet resumes. In both cases, we’re dealing with resumes. Resumes are definitely deep sources of talent data – and while they are not always complete or 100% accurate – most resumes do contain significant information about the people who wrote them. Even when poorly written, most resumes contain summaries of experience, objectives that can give you insight into the types of opportunities they are interested in, a work history giving you an idea of their capabilities based on their past responsibilities and experience, and of course an addresses – which can be critical in making an educated guess at whether or not they might be open to a particular commute. While this deep level of talent data is wonderful – it’s of little use if your ability to search for and retrieve the data is limited. Unfortunately, many ATS/CRM solutions aren’t very searchable. In fact, some are laughably unsearchable, considering a major reason for storing human capital data is (you would think) to be able to retreive it to take action on it. If you look closely at the chart above, you will notice it says “Most ATS’s.” That’s because there are some highly searchable ATS/CRM solutions on the market, and I am also aware of some “home-grown” systems that are also highly searchable. So while there are some highly searchable ATS/CRM solutions available, too many are unacceptably low on the “searchability” scale. When it comes to the Internet – while you can search the Internet and find resumes, only Bing supports queries employing full Boolean logic. The irony there is that Bing limits you to 10 search terms or 150 characters (the documentation vs. realized results is sketchy). It’s nice that Google gives you 32 search terms, but in some cases, this limits your ability to configure queries that are precise enough and/or remove all false positives. And while finding some local resumes can be done using Internet search engines, it is difficult to be sure if you are actually finding ALL of, or even the best available, resumes. Because the Internet is unstructured, when you search for area codes, state abbreviations, and zip ranges (as you can with Google), you often get a number of false positive results. And if a person puts their resume online but does not list an address or a phone number – good luck trying to find them as a local candidate. To be highly “searchable” – it should not be hard to find exactly what you’re looking for, and you should not have to suffer many irrelevant results. Here we have Twitter and LinkedIn. I’ve written about this many times before – Twitter is an extremely shallow source of talent data. The operative word in the term microblog is “micro” – 140 characters for Tweets and 160 characters for a bio. That’s not a whole lot to go on. While some tweeps do tweet about their professional life, many do not. Also, many people don’t give away much information in their micro-bio either. Unlike Twitter, which by design is a shallow source of talent data, LinkedIn is a deeper source of human capital data. However, while some LinkedIn profiles are as detailed as a traditional resume, there are still plenty of profiles with very little, if any, information on them. I have no doubt that over time more people will flesh out their profiles with more information and LinkedIn will move to the upper right quadrant of the chart. Here’s where both Twitter and LinkedIn shine brightly – searchability. Twitter employs tag searching (hashtags #), supports full Boolean logic, enables location searching via geocoding ( SQL near:DC within:25mi), and some third party applications (e.g., Twellow) allow you to search specific fields such as bios (@bio developer). Click here to learn more about searching Twitter for sourcing candidates. LinkedIn supports full Boolean logic and can accept and run insanely long and complex queries, allows for Boolean searching of structured data (current/company, current/past title, school…), has configurable location searching, supports industry and group search, as well as “hand-coding” of searches with LinkedIn’s own advanced operators (ccompany:, ptitle:, etc). Here’s the sweet spot for sourcing and recruiting – sources of talent data that offer significant depth of information AND are highly searchable. In this quadrant we have the job board resume databases and something I like to refer to as Talent Warehouse solutions. The job major job board resume databases (Monster, Careerbuilder, Dice) all have…that’s right – resumes, which as we have already seen are deep sources of talent data. Resumes offer a work history including career progression, skills and experience (at least to some extent), environment/group/division/project information, education, and precise location. In many cases, resumes will detail specific responsibilities and responsibility level, as well as accomplishments and achievements. In addition, all of the job board resume databases are also highly searchable, supporting full Boolean logic, useful query modifiers such as the asterisk for root-word searching, structured field searching (recent experience/titles, etc. ), and configurable location searching. Sourcers and recruiters can run Boolean strings and structured queries when searching job board resume databases to precisely target specific experience, years of experience, education, certifications, environmental/project, and industry experience. Those who are particularly adept can even achieve semantic search by crafting Boolean strings that go well beyond buzzword matching and target specific responsibilities, or in other words, what the candidates have actually done as well as what they have done it with. The combination of deep data and high searchability affords you the ability to search for and essentially control critical candidate qualification variables enabling “high yield” e-sourcing – a high volume of more accurately and appropriately matched results in less time. Just as Business intelligence applications are typically supported by a data warehouse – which is the main repository of an organization’s historical data, also known as corporate memory (the total body of data, information and knowledge required to deliver the strategic aims and objectives of an organization) – a ”Talent Warehouse” serves as the main repository of an organization’s Human Capital data, and it would serve as the raw material for a Talent Support System (TSS) – a computerized system for helping to make Talent-related decisions, such as talent identification and acquisition. The core of a Talent Warehouse is a relational resume database. We’ve already established that resumes are deep sources of human capital data – but you may have noticed that on the chart above, “Talent Warehouse” is actually higher on the scale of data depth than other sources of resumes. “What’s a deeper source of human capital data than a resume you ask?” A Talent Warehouse adds more depth to resumes through the use of comments/notes and tags – sourcers and recruiters can add additional information to candidate records and resumes based on phone screens, in-person interviews, references, tests and evaluations, etc. Imagine being able to search for candidates based on information contained in their resumes AS WELL AS information gleaned from the candidates through interviews. Imagine that! Although many Applicant Tracking Systems, HRMS/HRIS solutions and Recruiting CRM applications make lofty claims as to their capabilities and functionality, I don’t consider (m)any vendor solutions currently on the market to be a true Talent Intelligence/Talent Warehouse solution. Most are simply systems that track and organize applicants (ATS), and/or enable the management of “relationships” (CRM), and they often they lack a critical piece of the puzzle – searchability. A true Talent Warehouse has a search interface that supports the searching of resumes as well as tags and notes using both standard and extended Boolean queries (including configurable proximity and variable term weighting) to enable effective semantic search as well include an Artificial Intelligence resume/job matching engine to cover all angles. This kind of search interface and engine can enable sourcers and recruiters to quickly and precisely find quantities of well qualified candidates. In the hands of an adept Talent Miner, a Talent Warehouse can yield a high volume of results with a high percentage of candidates who have specific skills and experience, specific responsibilities, specific years of experience, specific environmental/project experience, and who live in a specific area. What this essentially affords a recruiter is the ability to leverage technology to find, contact, and establish and build relationships with more of the right people more quickly – increasing effectiveness and productivity! You can find and hire people by searching any electronic source of talent data – resume or otherwise. However, searching shallow and less searchable sources such as Twitter, Facebook, Google+, blogs, the Internet and other similarly shallow sources of candidate data takes a higher amount of effort for a smaller return – a low ROI. This results in low yield sourcing and recruiting and ultimately lower productivity. If you have deeper and more searchable sources of talent data, why would you go out of your way to (or allow your sourcing/recruiting team to) focus on low yield sourcing and recruiting? 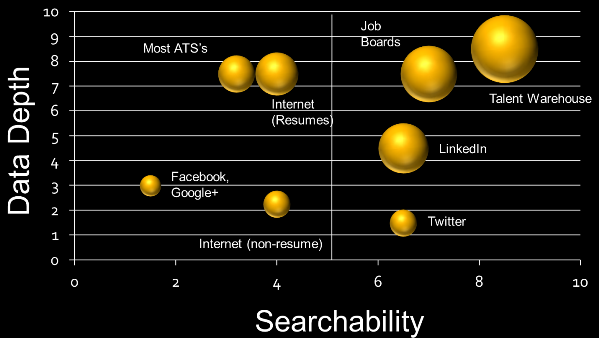 Highly searchable and deeper sources of human capital data enable you find more appropriately qualified candidates more quickly, through your ability to search for, control, and quickly analyze and assess critical candidate variables such as specific roles/responsibilities, years of experience, skills/technologies, environment, education, and location. This results in a higher return on time invested and higher productivity. While it may sound perfectly logical to start with the deepest and most searchable sources of talent data available to you, I assure you – not everyone actually does this. I continue to see and hear about sourcers and recruiters who are blinded by buzz of sources like Twitter and Facebook and who spend more time using them than their own ATS/CRM, or other deeper and/or more searchable sources available to them. And if your private candidate database/ATS/CRM isn’t as searchable as it could be – consider doing something about it– because it should be. Make the conscious decision to focus the majority of your e-sourcing efforts on the highest ROI sources – those with deep data and those that are highly searchable.